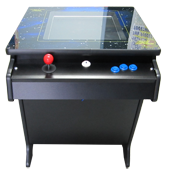 This Arcade Table Top has all of your Classic Arcade Games in one complete unit, challenge your friends to see who the arcade master really is. 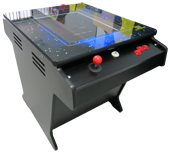 Play all of your favourite Arcade Classics like Pacman, Galaga and Space Invaders, a fun time to have with all of your family. 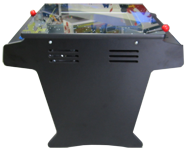 Home Classic...Our newest selling Arcade Table Top machine, the best Table Top on the market. This machine comes without a coin acceptor specifically for Home use, Comes in a large number of colors or we can Custom make it just for you and your decor. The Timber is 16mm melamine, various colours available. The Control panels are Black. All holes are CNC cut for accuracy. Glass is 5mm clear and Chemically Toughened. Easy access door to allow for any adjustments.. The Glass top is bonded to the timber lid so there are no corner brackets, gives you a smooth clean surface. There are eight air vents for cooling on the cabinet. Reliable Heavy Duty Power Supply. Great artwork on the Top to give you a space theme.